COPY OF THE SUBWAY DIARIES! "I sing, I raise vibration, I cause people to smile, grin, dance & feel. 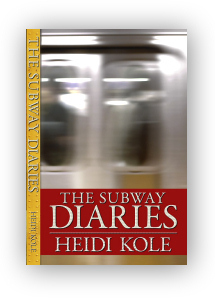 I move souls in the world's most unlikely of places ..."
Heidi Kole - "The Subway Diaries"
After experiencing an accident; concussion and whiplash, and the resulting awakening that occurred while being thrust into the NYC Subways. The Subway Diaries is a first hand account of author, musician and professional stunt person, Heidi Kole’s life as a busker in the NYC Subways. The book leads you on a rapid, humorous and insightful ride through the musical world pulsating beneath New York City, The story is both a personal journey of awakening and loss of ego as well as a sociological study of the phenomenal and often colourful sub-culture of artists and musicians that exists underground in the city of New York. Captured is both the joy of the artists underground, their unique place in the city, the bond amongst themselves and their shared struggle to continue to make music in an environment of ever-heightened security & tightened personal freedoms. rockin' T's and Baseball Caps! Just click below and you'll be on your way!